Introducing “Greetings from Los Angeles,” my latest pictorial history from publisher Gibbs Smith. Following the format of my other books, “Greetings” is a comprehensive, humorous, historical tour of Greater Los Angeles told through vintage images (postcards, photographs, brochures, matchbooks and other dazzling ephemera). This is the amazon link if you’d like to purchase a copy, or come to my book launch/slide talk at Soap Plant Wacko in Los Feliz on August 19th where there will be a special surprise (more on that in a few days). Featured are over 250 rare glimpses of the city, starting with its early years as a dusty pueblo; Chinatown’s evolution; the miraculous orange empire; backyard oil wells; Venice of America; roaring 1920s and corrupt 1930s; colorful evangelists; glamorous Wilshire Boulevard; fabulous nightclubs; movie studios and lavish stars’ estates; and theme parks such as Disneyland, Knott’s Berry Farm, and Marineland of the Pacific. Witness the birth of midcentury modernism, futuristic Googie coffee shops, and space-age LAX. Recall a postwar suburban paradise of drive-ins, bowling palaces, beach parties, Dodgers baseball, hotrod culture, and mushrooming tract developments. Fun facts and images that didn’t make it in the book will be posted on Facebook and Instagram soon. Gallery | This entry was posted in Home. Bookmark the permalink. 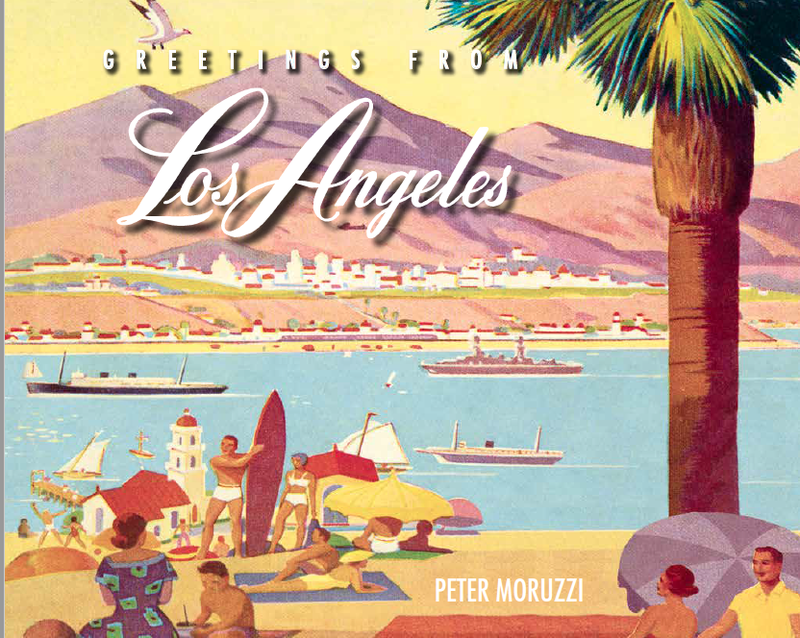 1 Response to Peter Moruzzi’s New Book “Greetings from Los Angeles” Is Finally Available!